St Malachy's FC is a Dublin soccer football club that was founded in 1968. Based on the northside of Dublin St Malachy's play their home matches at soccer pitches at Springdale Road, Dublin 5 and at Edenmore Crescent (for AUL matches). 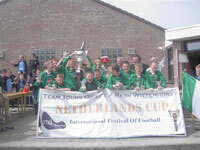 The club competes in the Dublin and District Schoolboys League and the Amateur Union League.